How fabulous is the ‘Search’ function in our computers? Within just a few seconds, we can easily locate a document we need and sometimes, when a customer is on the other end of the phone waiting impatiently, it can be a real lifesaver. Even with the dawn of the new age in technology, you are bound to have some loose papers, probably in a very large pile that you ‘plan to go through soon’. Ehum. That day is today! A good filing system is critical to running a successful business, as it impacts greatly on your productivity and organisation. I’m talking physical papers here, but if your desktop is full of folder-less documents – you may have twice the work to do. Here are some tips to get you well on your way to being crowned Mr/Mrs Organisational King/Queen. Throw out anything that is not vital to keep in paper copy. If you have this document already saved on your computer, it hasn’t got any first hand signatures etc on it, you don’t need to do anything with it i.e. send it off and you don’t need see yourself needing this hard copy in the next few weeks – chuck it! If it has your address, name, details, bank details or anything you wouldn’t want a stranger seeing – shred it. It isn’t worth the risk of a malicious attempt of an identity theft of any kind. You need to get those oh so important files that you need to keep out of the pile and into some folders. A lot of blogs and Pintrest pages really overcomplicate this step of filing, to the point where it gets overwhelming. All you need to do is get yourself a simple filing folder, with little tabs (there are some made just for filing) and label the tabs in alphabetical order. You can even get an extra folder and use this for personal documents. Do not, I repeat, do not have a break during action step 4, as you will probably not come back to it. 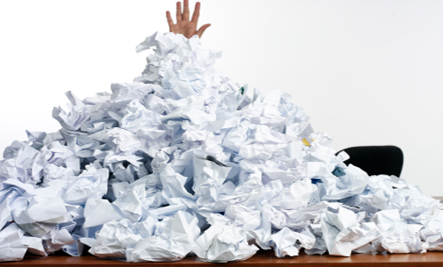 Pile your documents into little groups of related types of documents. Then put each pile of documents into the folder, don’t overfill, and then label the tabs AFTER you have filed. Now this is the hardest step of them all. You have got to now keep this up! File as soon as you receive an incoming document, be it scanned and kept on your computer (under relevant folders, one can hope) or put STRAIGHT into your beautifully constructed filing folder. It takes ten seconds as opposed to a huge pile of papers and then the four steps mentioned above, every month. You should finally buy one manila folder with ‘ongoing work’ on it, to make sure you never get that dreaded pile of papers again. But be consistent with the theme of ‘ongoing’ work though, and don’t just use it to make yourself another unorganised pile! All in all, filing is only intimidating if you don’t do it. By consistently keeping up with your new system, you will never have any problems locating documents, ever again.